This mural, covering 130 square meters, is a reproduction of an original painting by artist Miyuki Tanobe, commissioned by MU. It depicts winter play in an urban setting, daily life in a vibrant Montreal neighborhood with a few anachronisms for good measure. The mural was completed over a nine-week period by muralist Annie Hamel and the MU artistic team. 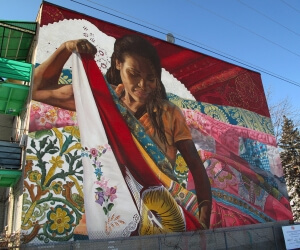 The mural celebrates the work of Miyuki Tanobe and accordingly, is part of a series entitled Montreal’s Great Artists, initiated by MU in 2010. This Japanese-born artist settled in Montreal in 1971. Created in the Nihonga style, her colorful and vibrant artwork often portrays scenes of everyday life in Montreal and can be seen in many international museums. Mural arts workshops were also offered to Verdun youth taking part in activities orchestrated by l’Ancre des jeunes, a local community organization.